A Few Plans For The Rest Of The Week: finish some orders, go to the doctor (again) and make some things for Spring. These will be available soon on my web site at a bargain price! Hey guys! Hope everyone has had a great weekend! I'm kinda looking forward to getting back to work this week. I have so much to do and last week was sort of screwy. I am so blessed to have so many orders with this economy. Every day, I am more amazed.....I have some of the best customers in the world and I thank God for them. OK enough of the mushy stuff. My question and thoughts for today are ......is anyone out there interested in bartering??? I see several folks on their blogs are doing it or have at least tried it. I think it would be fun!!! If you're interested, email me. I would be totally excited about anything iron, woven placemats/runners, wood cabinets, crocks/pottery, patterns, basically anything I don't make. Keep me in your thoughts. It's getting close to when I have to go back to my oncologist to see if the medication is helping my blood problem. (Not a fun time). I'm trying to be optimistic, but they said it could take up to a year to get my numbers up. We'll see. Gonna get to bed soon. Until next time. It's been a few days since I have felt like posting. Finally, it's Friday and I am feeling better. This is my favorite for this week. But, I have a few other thoughts from earlier this week that I would like to post later or tomorrow. Believe it or not, but I have had this sofa table for over 20 years. I went to one of those huge craft shows at Harper College in Schaumberg, IL. Caity was just a baby. I remember pushing her around in a stroller for hours at this show. If I remember correctly, I paid like 79.00 for this. Wish we had shows like that nowadays. The pottery pieces came from Seagrove, NC. The step-stool, cat and heart were made by me. The sheep came from a local prim shop and the shaker boxes were painted by me . The resin bowl came from an outlet in Archdale years ago. Lots of prim goodies! Patricia Potter was VERY busy at the time with Christmas orders, so we decided to wait until her schedule wasn't so hectic. She recently picked these and I'm posting the pic for all to see. I sincerely hope she enjoys her selections. The Simply Blessed sign is one of my personal favorites. and put January contest in subject line. That's all there is to it. No purchase necessary! It was much nicer in K-ville today, not nearly as cold as the past few days. Thank goodness! We're just not used to such cold temperatures. Personally, I just about freeze anyway and the last few days have been miserable for me. I have bundled up like an eskimo!! LOL!! I'm think about putting it in this little burgandy frame? Anybody have any thoughts on this??? Please don't be shy...feel free to leave a comment! I welcome your imput! That's enough rambling for today! Take care. Until next time. We woke up early to another super-duper cold day with temps in the single digits. On this particular day though, we had no HOT water in our master bath! We had it in the shower and the rest of the house, just not at our double sinks. In all of our years together, living in all the different houses, condos and apartments, never anything like this. But, after leaving the cabinet doors open and hoping for the best.....we left to go eat breakfast and do some errands. When we returned home after 1:00 or so, everything was fine and back to normal. I think I heard this is the coldest it has been here in several years, so next time we'll keep the water dripping, maybe?????? Today is Bill's birthday! I won't tell you which one, but let's just say, he's getting on up ther. But, all in all, he says he didn't feel any different than yesterday, so I guess that's a good thing. 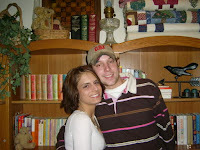 We went to breakfast at one of his favorite spots in Winston and then for dinner, we went to Red Lobster. Not one of my favorites, but he loves their shrimp and we had a discount coupon to boot, so why not. It was really good and I totally cleaned my plate! LOL! I was absolutely amazed at all the folks that were there today! We waited close to an hour just to be seated! There is NO recession in Forsyth County!!! Everywhere we went today, it was busy and believe me, we made the rounds. I spent about an hour in Michael's today shopping and they were very busy. I guess lots of folks crafting with the cold weather. Every year around his birthday, we start discussing what he would like for a gift. He had mentioned a few things, some of which I don't have a clue what they are. But, I ended up getting him this really nifty little "Gadget" . It's like this really huge Duracell battery that can work as a portable emergency power . You can fill tires along with toys and such. But, then it's still more.....you can jump start your car and it has a flashlight built in. Pretty cool and the perfect gift for him. Sorry....y'all! This was supposed to be Shari's Friday Favorite, but I had such a lousy day, that I never got around to posting anything. Thank goodness, I'm feeling better today. I guess everyone has good days and bad days, huh??? This is one of my favorite places to sit and read. The lighting is great and wing chair is very comfy. I thought yesterday was cold....but it's gonna be in the teens here tonight! Way too cold for us. It's in the low 20's now and it's not even 10:00. It will be colder than a well digger by morning. I have 4 and they're $16.50 each plus shipping. (5 inches tall, 6 inches across with 4 wicks. 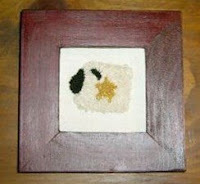 )The patchwork candle quilt is $8.99 and will be on my web site soon. The rag balls are already on there. This was another project that I finished up today. I must say, there are advantages to cleaning out and cleaning up in the craft room. I have found more treasures that I had completely forgotten about. It's really quite funny! This little grapevine tree and lites have been around since at least 2007, maybe longer. Just never got around to putting the pieces together. I think I'll keep this one for myself. Christmas is over, but I think it'll be out all year long. Thursdays are my favorite night to watch TV and my shows are on.... So I'm gonna run for now. Stop by my web site soon and try to STAY WARM! It has finally turned REALLY cold in K-ville! I did not venture out of the house today. There are not too many days that I can say that. For most days I just have to run to the Post Office, Walmart or the Grocery Store or just somewhere!! LOL!! Believe me, today was not one of those days. Hubby stopped at the grocery store on his way home to pick up salad greens, so I decided to start dinner and make myself a cup of tea while I was waiting for him. I have actually had a very busy week and it's hard to believe that it is already Wednesday. The other day I read a post by Karen of KM Primitives and I really got inspired to clean and organize my craft room! I told a friend yesterday that it was driving me crazy that my room looks like it threw up fabric, paint and wood. So, this week in between working on orders, I have been trying to figure out a PLAN...it's not easy when you do as many different crafts as I do, but IT IS going to happen! One way or the other! Thanks so much, Karen! One day I will post pics of my work area. Yesterday, I woke up early and started grunging candles. 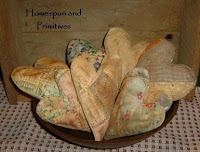 I usually multi-task when I do that so I decided to make hearts from old and recycled quilts. I grunged them and baked them in the oven between doing the candles. This is how they turned out. They probably won't be on my web site, but if anyone is interested in them....the smaller ones are $3.00 each and the larger ones are $4.50 each. Grungy muslin is on the back of each. Do you love the way they turned out??? I'll post pics tomorrow of a new pillar candle that I did. And a few that I did for Valentines Day. Okay, it's getting late and I still have a few things left to do. Still waiting on someone to give me some ideas for Valentines Saying. A Few Plans For The Rest Of The Week: Continue working on orders, adding new goodies to the web site and working on my craft room. My table bench on my breakfast room table. Today, I painted the rustic brown coffee pot a nice black satin finish. I filled the pot with tapestry colored pip berries and added a rusty star cookie cutter on the handle. 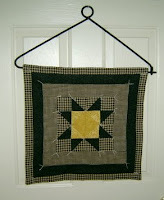 The mini homespun quilt is one I made a few weeks back. The yo-yo quilt I made years and years ago. 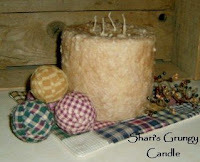 The shaker box, candleholder and the grungy heart were in other locations throughout my house. I love the way this looks all grouped together. Now all I need is a new light over my table. Wonder if you could get black spray paint to stay on brass??? A few more things to do and I'll be done for the day. A few things that I started yesterday and finished up today. Perfect for your kitchen table! I'll post pics of mine tomorrow. Special request for a special customer. Still looking for Valentine's Day sayings. Today, turned out to be a very busy Saturday for me. I finished up the last of my "OLD" orders and that is a huge relief! Worked on a few special requests and got those finished as well. I seem to be on a roll, so I started a few more projects. Tomorrow should be interesting....I'll try to post some pics of what I'm working on. Lately, I have been having a few computer issues with software and I couldn't "develope" my pictures. Bill spent the better part of 1/2 a day trying to get it repaired. Finally, he figured out that it was the card in my camera. Put a new one in, reformatted it....and it works like a charm! Yipee! I was having to reboot my computer everytime I wanted to upload pictures. So now I can post more pictures and add new goodies to my web site. I think this is very appropriate for folks who have been together as long as Bill and I have been. Any ideas would be greatly appreciated. AND, if I use your idea, I will give you credit for it. And speaking of appreciation.....I would love for some of you NC folks to comment or sign the guestbook at the bottom of this page and let me know who you are. I would like to thank you personally for stopping by to visit. And besides I think it would just be fun to chit chat. I am going to start posting my Friday Favorites again.....this week it's my fireplace hearth. It's been filled with lots of my favorites. I have put my kneeling bench ( the one my dad made) here along with a wire basket filled with almost perfect pinecones, a sheep pillow, a candleholder, 2 old pieces of pottery and a couple of pieces of treenware. It truly is one of my Favorites! The craft mall repairs are not moving as quickly as they originally thought they would. So, they won't be re-open until later in February. We're hoping the craft mall in Walnut Cove will be re-opening February 1st. Kathy says that is the target date and things are moving right along. She is planning a Grand Opening with TV and newspaper ads. Where has this week gone? I haven't accomplished nearly enough this week. Today, I finished up a bunch of orders and got them shipped, which was major for me. And then I had to make a quick run to Hobby Lobby in High Point to pick up a few things. Couldn't believe the weather! Almost blew me off the road. And rain, and rain and more rain! But, on the way home I saw this wonderful double rainbow! It was so fabulous! Wish I would've had my camera. Wanted to tell you guys about my new candles that I picked up the other day. They'll be on my web site soon along with the candle tarts. These are 100% soy wax, non toxic, lead free, and hand poured. There's no Carcinogens and no Harmful Dyes. 0% dependence on foreign Oil! They are all this fabulous creamy color with the matte finish lids. So far I have 3 fabulous scents to go along with my room sprays. I have the tarts in Cinnabun scent. They smell good enough to eat! Actually, the other day I had to stop at a Fast Food restaurant, cause I got so hungry smelling these fabulous candles in my car! More scents will be coming soon. That's all for this cold, rainy, windy Wednesday evening! First of all, we picked the worst possible weather day to take a road trip. Retha, Bobbie Jo and I left bright (well, actually it was very cloudy) and early this morning and headed to historic Apex to check out the Rusty Bucket. It was a trip we had been planning to take for quite a while, but just haven't gotten around to doing it. Since Bobbie has to go back to school tomorrow, it had to be today, or who knows when we would have another chance. I, personally had a terrific time meeting Pam and seeing all her treasures. A really neat store with a lot of personality and the classes she offers are fabulous. We all wish we were closer so we could participate. I made my list of needfuls before I left home and I bought a few things that I absolutely adore. Not anything that was on my list, but still things I "needed". Almost the first thing I saw was a piece of pottery and I knew it was coming home with me. A black table was another great find. It didn't fit the spot that I had hoped for, but I'm sure it will find a place in my home. A little chalk board on a stand was something else that I just love. ( Bobbie has one and I have always wanted it, heehee.) A woven runner in burgandy and tan was the final piece that came back to K-ville to live. Hopefully, if you are ever in the area you can check out the Rusty Bucket too! I look forward to going back one day soon. And Pam, thank you so much for your kindness and showing us around. A Few Plans For The Rest Of The Week: Going to finish up some orders, going shopping at a Prim Friend's store, looking for Valentine supplies. Here is picture thought I am sharing... Thinking about making Valentine Annie for my web site. Well, blogging twice in one day is just too much! Be back tomorrow with what we found on our trip. Yipee! Thanks go to Sharon over at Prim Thyme! (http://primthymesblog.blogspot.com/ )for the award she presented to me. 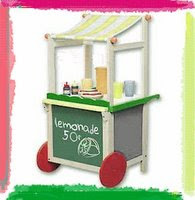 The Lemonade Award is for blogs that show great attitude and gratitude. I think it's so nice to be recognized and I hope more and more folks will continue to come over and take a peek. .2. Nominate at least 10 blogs which show great Attitude and/or Gratitude! Here are a few blogs that I think show great attitude and gratitude. I suppose after all the shopping trips, visiting friends & family, eating and gaining those few pounds, the holiday is officially over. Tomorrow, hubby goes back to work, the kids go back to school and I can finally get back to my routine. There's a few errands that I need to do first thing, but then I am planning to sit and sew the rest of the day. Yipee! I have quite a few orders to do plus a few special requests to start on. And it will be so nice!!!! My house is actually clean after putting away all the Christmas treasures and bringing out just Snowmen until I can decorate for Valentines Day. Amity popped in this afternoon with Alex and Miss Elle for a short visit. She had a few Christmas things she didn't want anymore, so she brought them to me. I'll have to have a good look and decide what to do with them. Maybe Ebay or Craig's List? One thing she brought was a set of 12, square, paper mache Christmas boxes like I have in my dining room. Mine have been painted and sponged and her set was left as it came with allover stars and trees on top. They are pretty cool cause stacked up they are taller than me....I'm sure someone would love them if I can ever get around to painting them. giving me a run for my money in her teenage years. We are so proud of her. And for all you Moms and Dads out there....there is hope. Just hang in there and therapy helps! LOL! ps I figured out how to get my signature here. Just would like for it to be a solid color, like black.....I really think it is the background color that throws it off...Still looking for someone to help me with some tweeking. Please feel free to contact me. Trying to figure out to add a signature to my posts....I think it has to do something with the background color. Any ideas on how to fix it???? Any professional bloggers out there willing to help??? I need a little help with a couple of other things as well. Crock Bench in Foyer. I think it always seems a little empty after taking down all the decorations. Christmas 2008 outside on a windy day. Trying to decide what to do for January. I already have my plan for February. Maybe just some snowmen???? I wish I could leave my wreaths on the windows all the time. It has such a cozy feeling, don't ya think? Alex and Miss Elle....My 2 favorite people in a fun button frame. This is one of the sweetest pictures they have ever had together. I will put it in an everyday frame and keep it out all year. This is probably one of my favorite pics ever. I never got around to selling this sign on my web site this year (just made a few for me and a couple for friends), so I thought I would take one last picture of it so maybe I could do a Christmas in July or something. Just happened to notice when I was cropping it that my hubby is peeking thru the window. Too Funny! He will probably kill me if he sees this, but I think it is too funny not to share! Just so ya know.....I didn't get off to a great start for 2009. Woke up early with the headache from H---, but managed to get breakfast made before I crashed on the sofa with Rufie. I'm wondering if you can have a headache from being anemic??? I'm hoping this is not yet another symtom. Everytime I turn around lately, there is something else to add to the list. ( I already have the tiredness, the lung thing, and the pain in my leg. That's enough!) Although, my lungs are doing a little better today. Maybe, because I did absolutely NOTHING. Only a few more weeks, and we'll know if the medication is working. Keep your fingers crossed for me. If it's not better, my new doctor is going to give me iron infusions. Don't have a clue what that is, and hope I don't have to find out. I am trying to get a few new things made for the web site and have actually managed to add a few new goodies this week, but it's probaly going to be first of the week before the new Valentine collection is finished and ready to go. I'm also thinking of making these for the new year. Brady the bear is so precious, although he sort of looks like a dog here. I used flannel and probably should have used something else with a little more texture to it. But, I love him just the same. Gracie the doll is just wonderful too. She's tall and skinny and has loads of personality. So, do y'all think I should make these for my web site?? Feel free to leave a comment and let me know.